Someday I'll Sleep Autism Blogs: Go Pats! Are you guys watching the game tonight? "OK I like you Tebow, but your season ends next Sunday." So the game is actually tonight (not Sunday), so hopefully Denver's season ends tonight (and the way it's going it should!). Grumpa's team already won tonight. 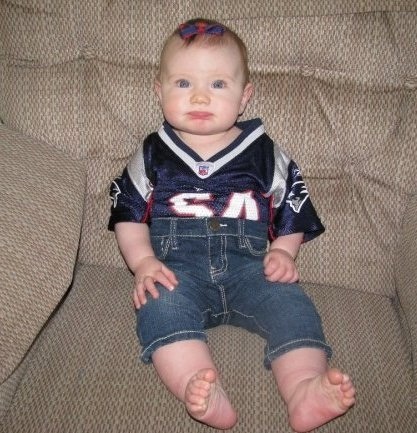 What's going to happen if Grumpa's team plays Daddy's team in the Super Bowl?!?!?! I grew up a Patriots fan, and am still mildly interested because my 91 year old Dad is a huge fan, but I'm kind of over Tom Brady. I just don't see the Broncos having much of a chance, barring several miracles. I'm kind of over Brady too. That's one reason I scrambled to get a Bruschi jersey before he retired, and was adamant that I did not want to get Sadie a Brady jersey! Blasphemy!!!!!!! GO COLTS! Next year. *sheepish grin* I'm so glad there are other women football fans. My husband "claims" to be a Packers fan. He didn't even watch football until after we got married. On the other hand, I still dream about the '85 Bears! I am a football fan too, both My teams are out, I'm rooting for the Patriots over the Ravens, I am pretty sure I'm rooting for SF over the Giants. Eli is not the Manning I want to see in the playoffs.